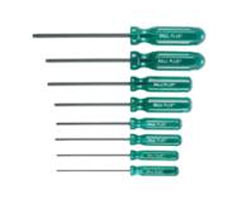 We are well recognized in the market for successfully handling the emerging market demands of Amber square shank go-thru screwdrivers. These are made available by us in model no AM-6500 and in tip sizes of 4.0, #1 and 6.0. Further, these are offered in mm of 75mm (3") and 38mm (1-1/2").